Every year, Gift of Life honors donors, recipients, volunteers and the many people who support our mission at Celebrating Life events in New York and Los Angeles. Celebrating Life New York City was held on Thursday, February 22, 2018, with more than 300 people gathering to share in the festivities and show their appreciation. The event was hosted by Gift of Life’s Young Professionals Committee of New York City. Sarah Anders (pictured above left) was scared when, in 2015, some unexplained bruising led to a diagnosis of aplastic anemia, a disorder of the bone marrow that affects the body’s ability to make blood cells. After immunotherapy was found not to be effective for her, a bone marrow transplant was her best hope of a cure. Her matching donor was found in Gift of Life’s registry, and Sarah received a bone marrow transplant in July, 2016. At Celebrating Life, Sarah, 28, who is currently a graduate student in Public Administration at the University of Vermont, was invited to the stage to meet her heroic donor, Brett Augenstein, 25, a New York-based sports agent for professional golfers. After the two shared a warm hug, Sarah told attendees how grateful she is to him, and how important her transplant is, not only to her, but to her family and friends as well. "When you save one person's life, you're not just saving their life but making an impact on the lives of the people they love, and who love them," said Sarah. New York resident Brett, whose father is also a donor, was familiar with the process and felt he was incredibly fortunate for the opportunity to help Sarah. “For me it was painless – just two days of my time to help someone for the rest of their life,” he said. Donors often find that the experience of saving someone else has a profound effect on them, as well. This is certainly the case for Nick Hudson (pictured above right). When he joined Gift of Life’s registry in 2006 during a drive at Emory University, he never envisioned how his life would change. In 2008, he was called to donate bone marrow to a 4-year-old boy, Cameron “Cam” DiMarco, who was battling leukemia. The transplant was an incredible success, and Cam is now a thriving 14-year-old. The two were recognized on their tenth “transplant-iversary”, where they received a huge round of applause. Nick has virtually been Cam’s older “blood brother” since they first met, and that connection with Cam and his family is stronger today than ever. Nick’s experience as a donor led him to join the Gift of Life team. 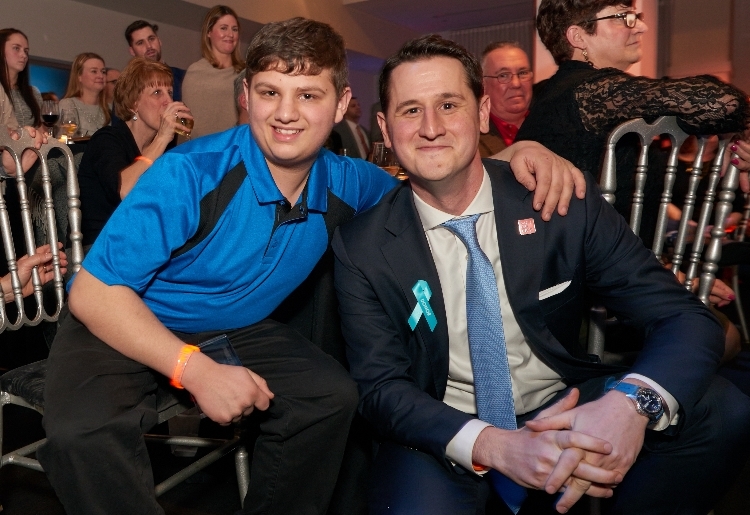 “After donating to Cam and meeting him and his family a year later, I kept thinking about how many more lives could be saved if more people joined the registry,” said Nick. “I contacted Gift of Life and asked how I could help, and started running drives, then joined the organization to help recruit as many people as possible.” Today, Nick serves as Gift of Life’s Associate Director of Development. Jonathan Struhl is another Gift of Life donor who has taken his involvement with the organization to another level. In addition to a busy career at a venture capital firm, Jonathan remains constantly active and involved in the organization, and was recently appointed to its Board of Directors. Cassi Imrie, the daughter of Jonathan’s transplant recipient Leya, took the stage to present him with Gift of Life’s 2018 Celebrating Life Award. 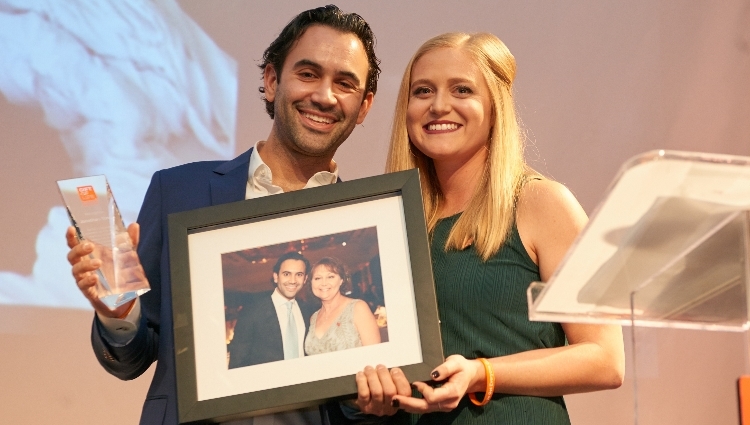 In an emotional presentation, Cassi thanked Jonathan for saving her mom’s life, and for all his work for Gift of Life, including helping to the New York Young Professionals Committee become a dynamic force advocating for Gift of Life. "It's very simple: save as many lives as possible." If you are 18 to 45 and want the opportunity to save another person’s life, we’ll send you a registration kit at no cost. Once your tissue type goes into the registry, you may be found as a match for someone suffering from blood cancer or an inherited immune disorder. To join one of our Young Professionals Committee chapters in Boston, Los Angeles, New York, San Francisco, South Florida – and coming soon to Chicago – visit our Young Professionals Committee sign up page.